Ferret in a Lab Coat - Why the Long Phage? Comic 14 - Why the Long Phage? 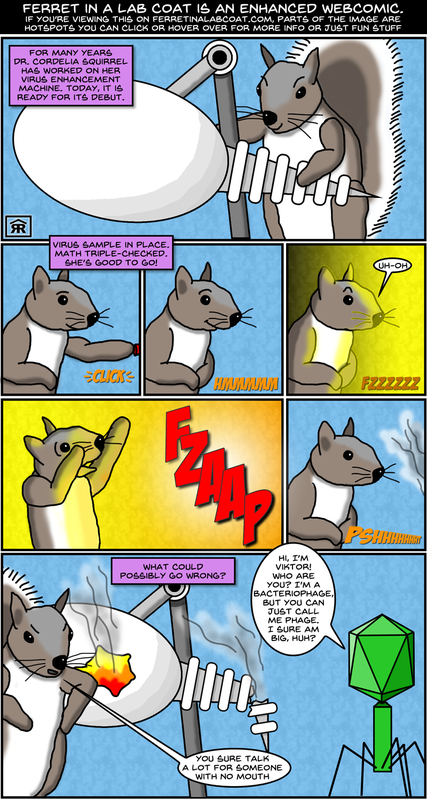 to learn about the interactive features of this Enhanced Webcomic. Updates on Mondays and Thursdays. For many years, Dr. Cordelia Squirrel has worked on her virus enhancement machine. Today, it is ready for its debut. Virus sample in place. Math triple-checked. She's good to go! VIKTOR THE VIRUS: Hi, I'm Viktor! Who are you? I'm a bacteriophage, but you can just call me phage. I sure am big, huh? CORDELIA: You sure talk a lot for someone with no mouth. Okay, we're fourteen comics in. I figured it was time to work on my lettering & lighting, add some props, and introduce a new character. I hope you'll make Viktor feel at home. Make sure to click on him and read his bio! On a side note, it sure is fun doing facial expressions on a squirrel! © 2017 - 2018 Gary Robson. All rights reserved.